CarGurus has 284 nationwide Eclipse Spyder listings starting at $1,850. As the convertible version of the Eclipse coupe, the Spyder aims at the middle of the sport-convertible market and provides a sporty driving experience with compliant suspension for comfortable long-distance cruising. The GS model comes underpowered with a 2.4-liter inline four. Stepping up to the GT trim brings a potent 260-hp V6, which can do 0-60 in about 7 seconds. Both trims come with a power-operated convertible top. Two transmission choices are available: a six-speed manual or five-speed Sportronic automatic that allows manual shifting. The top folds out of sight in about 19 seconds under a flush-fitting powered tonneau cover. Constructed out of cloth, not vinyl as on some cars in this price range, the top gives a speedster appearance to the Eclipse. A full headliner incorporated into an anti-ballooning design provides a quiet coupe-like feeling with the top up at highway speed. The glass rear window incorporates a defroster. Three available color schemes add to the attractive interior layout. A leather-wrapped steering wheel incorporates audio-system controls. The high-back bucket seats are Mitsubishi rally-car inspired. Both Spyder trims feature a 650-watt Rockford Fosgate stereo system with an in-dash 6-CD/MP3-playback-capable changer. This heavy sports convertible sits on a chassis shared with the Galant sedan and the Endeavor SUV. Yet while reviewers complain of the coupe's SUV-like turning radius, they enjoy its handling through twisting sections of roadway. Mitsubishi has made a good compromise between the taut handling of a two-seat sports car and the more yielding suspension of a four-seat family-sedan-based convertible. What's your take on the 2008 Mitsubishi Eclipse Spyder? 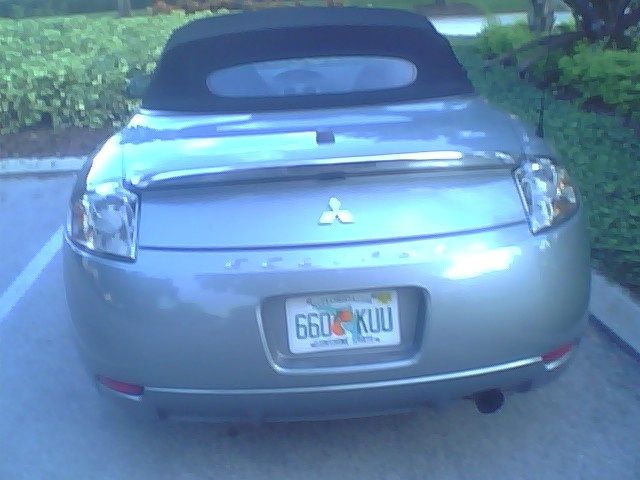 Have you driven a 2008 Mitsubishi Eclipse Spyder? 2008 Mitsubishi eclipse or eclipse spyder? How long does it take for a new listing to become active?